♦ Price pressures remained strong in March. Input cost inflation was close to February's 69-month record, reflecting rising global commodity prices and the historically weak euro exchange rate. ♦ Business optimism rose to a fresh series-record high, improving at service providers and remaining relatively elevated at manufacturers too. 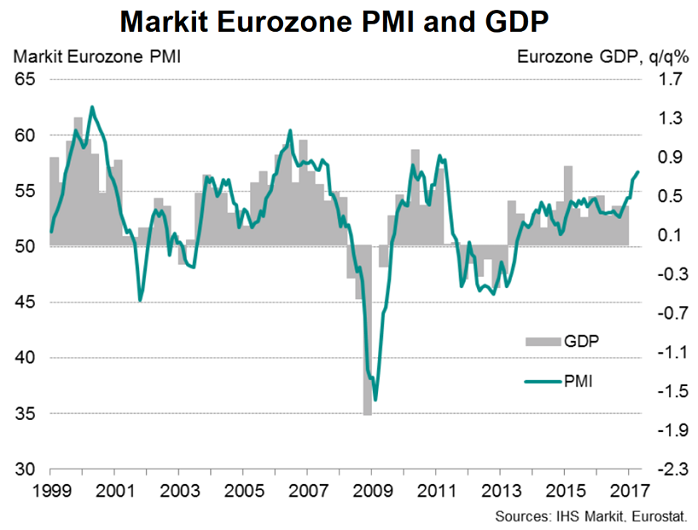 "This is a broad-based upturn among the euro’s largest members, with 0.6% growth signalled for both Germany and France, while Spain looks set to have enjoyed 0.8-0.9% growth in the first quarter, according to the PMI data. Growth has also perked up in Italy during the first quarter despite a slight pull-back in March, with the surveys indicating a 0.3-0.4% expansion. Most welcome for a region still suffering near- double digit unemployment is a rise in the survey's employment index to its highest for almost a decade, suggesting we should expect to see the jobless rate fall further in coming months."